We spent two weeks onboard MSC Magnifica in May 2018. In case you missed it, you can read our entire live-blog here. 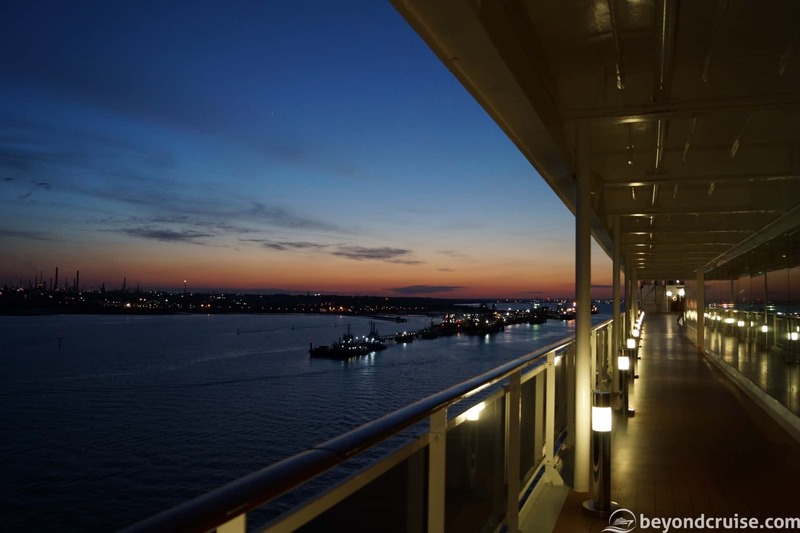 Since then, we decided to write some guides for people who haven’t yet had the chance to try out the ship – whether you have booked or are thinking about booking, read our guides for plenty of tips and advice! Our first guide is a full deck-by-deck guide of the entire ship. These are crew only decks and you won’t be down here anytime soon! 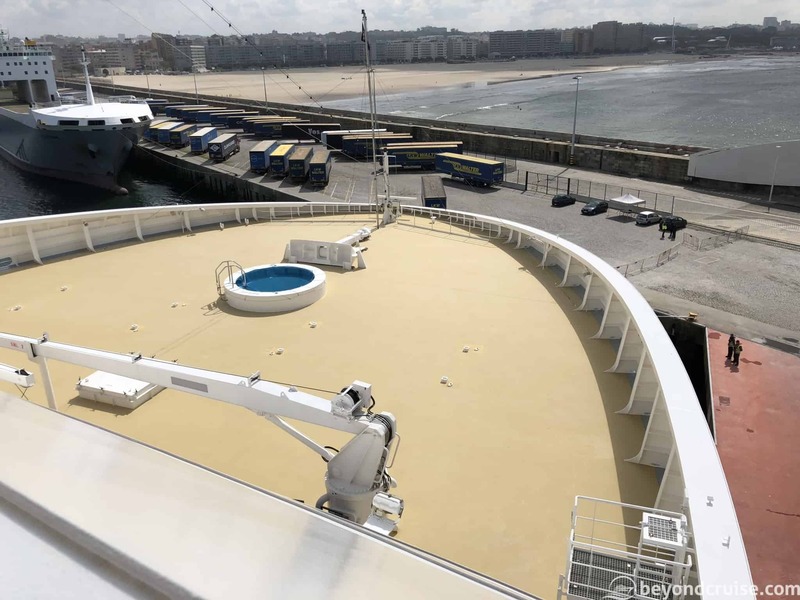 You’ll only need this deck if your port is a tender port or, depending on the port, one of the gangways is located on here. This is actually a crew deck but has passenger security facilities available on it for use when in ports. 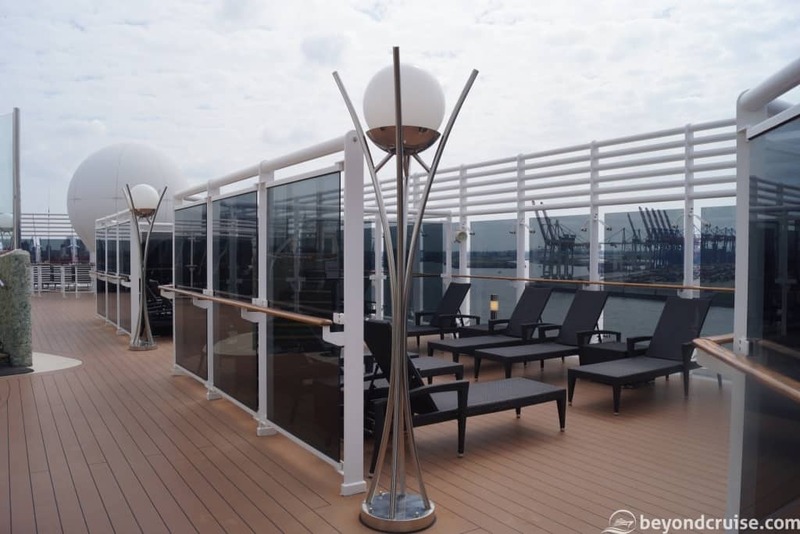 Additionally, this deck is also used frequently for guests in wheelchairs/mobility devices. 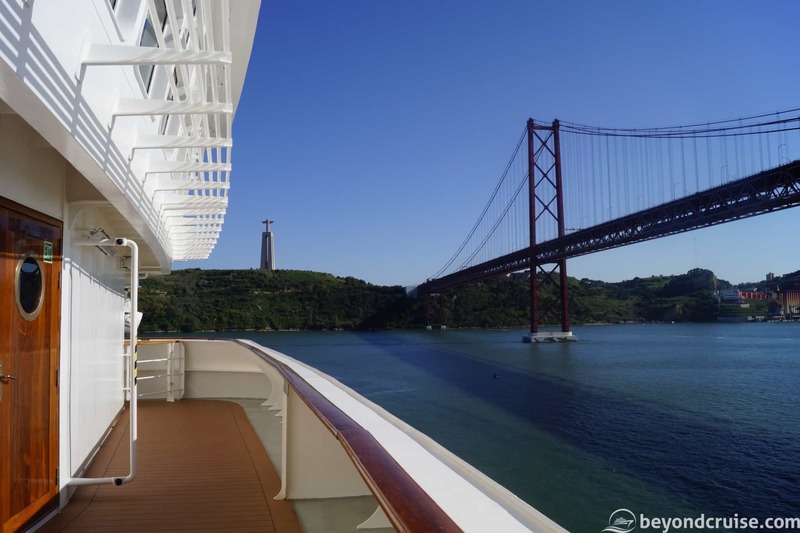 Not all ports have airport-style “airbridges” and the gangway can be on a slope from Deck 5. Usually (depending on the port, tide) Deck 4 will be a lot closer to the actual port level and therefore this deck is used for wheelchair/mobility access. This gangway is almost always in use for crew too. This is where everything starts, we’ll work from the front of the ship to the rear. First, you have the Medical Center. Hopefully, you’ll never have to visit this facility! 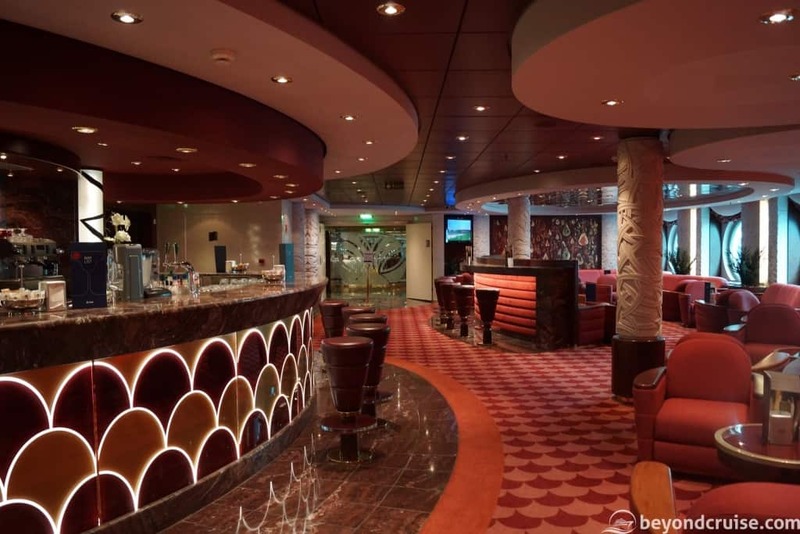 After some walking towards the rear of the ship, along a corridor of cabins (5002 – 5069) you will arrive at Le Gocce Reception. This is mirrored on both sides of the ship – one says Guest Services and the other says Accounting – however, both facilities are available at either side and are just as quick and helpful as each other. Inbetween the reception desks is a grand staircase leading up two decks and at the bottom of the staircase is a small area used for live music – usually consisting of a pianist and/or violinist. Behind them is a three-deck-high waterfall – this is usually off on sea days though. Next to this area on both sides is Le Gocce Bar – offering coffees and soft/alcoholic drinks. The final venue at the rear of this deck is L’Edera Restaurant. This is the restaurant that is used for breakfast and lunch each day and for early and late sittings for the evening meals. 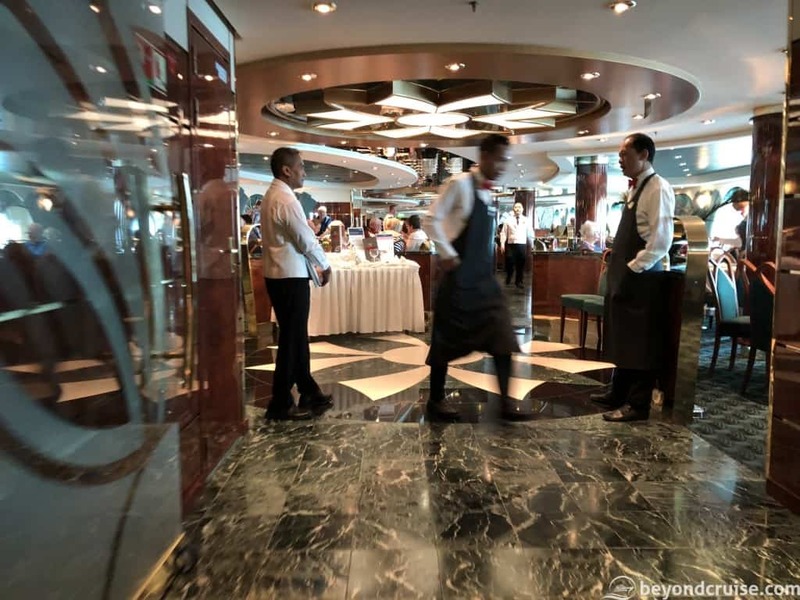 This expansive restaurant stretches the entire width of the ship and at the rear of the restaurant is a scaled-down version of the buffet (at breakfast and lunch) which you can mix and match with your served courses. 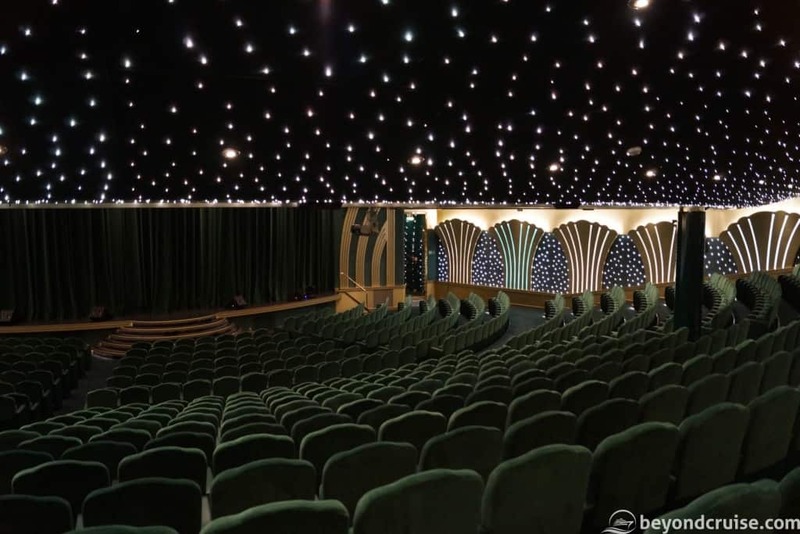 First, you have the lower tier of the Royal Theatre, this fantastic theatre is used nightly for performances ranging from opera to contortionists. It is also used for lectures, Masterchef @ Sea and the meeting place for some shore excursions in the mornings. As we travel to the rear you’ll find the Games Room (a small room for cards and such), Tiger Bar (entire width of the ship, used for live events each evening and activities during the day) and the Magnifica Meeting Room (for private events). 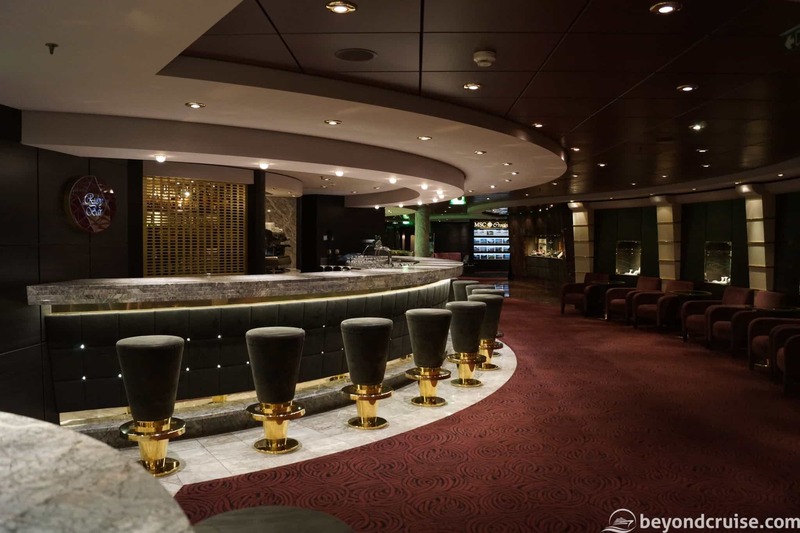 Further back you’ll encounter the Topazio Bar, which although is the full width of the ship – only has one entrance from the front. This bar hosts live music in the evening and events during the day. It also serves premium MSC Molecular Cocktails. There are numerous shops in this area, including the MSC Logo Shop. Next, we pass the top of the main staircase down to Le Gocce Reception and then the Shore Excursions office – available most evenings and during sea days. There are more shops located here too and split 50/50 across the atrium is the Ruby Bar and the Purple Bar. 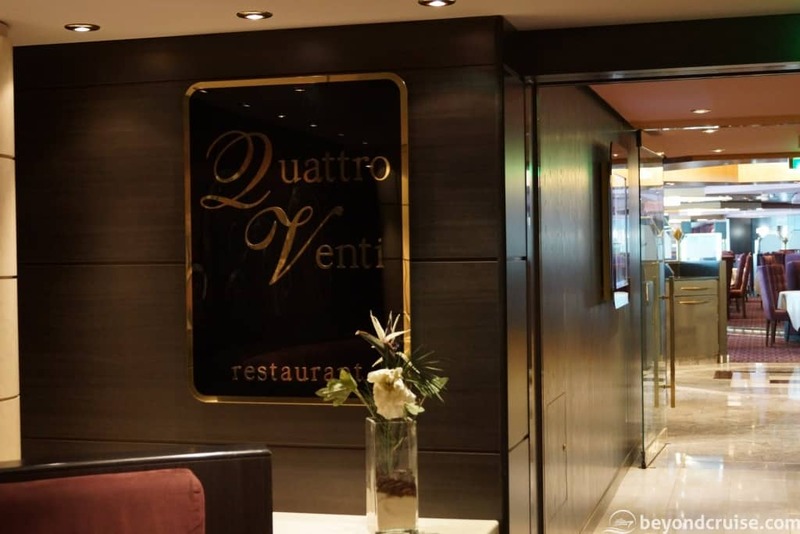 Finally, the last venue on this deck is the Quattro Venti Restaurant. 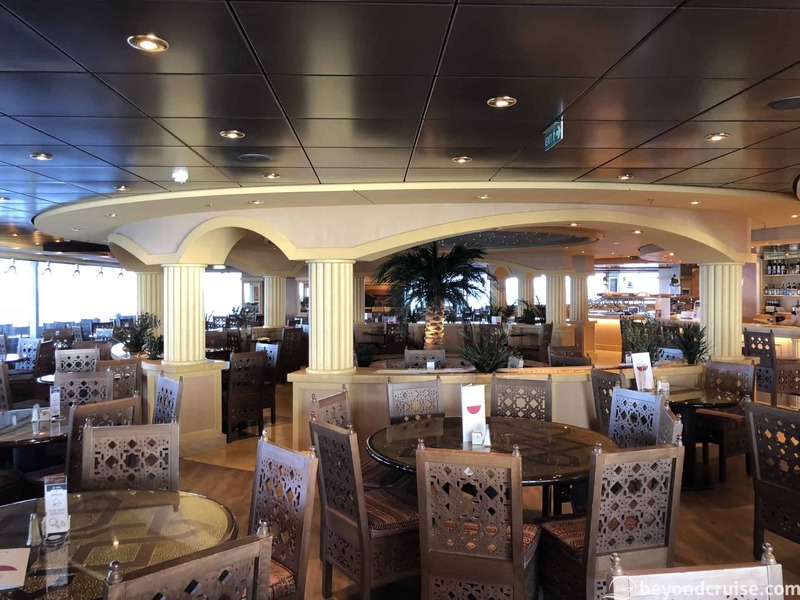 This restaurant is only used for evening meals (whether you are on the early or late sitting) and is the entire width of the ship. At the front of the ship, we have the upper tier of the Royal Theatre. We wouldn’t recommend this tier if you are in a wheelchair or find it difficult to walk, the lower tier on Deck 6 is much more accessible. 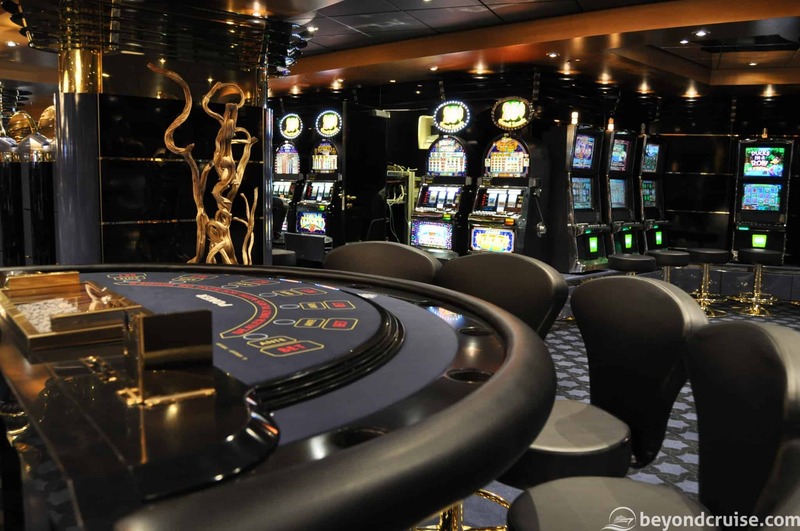 As we head to the rear, you’ll pass through the Atlantic City Casino – which is the entire width of the ship and features a large staircase at the rear which takes you down to Deck 6 and immediately into the Tiger Bar. Heading back further, we see the Cuba Lounge for smokers, the MSC Voyagers Club information point and the Cyber Cafe. 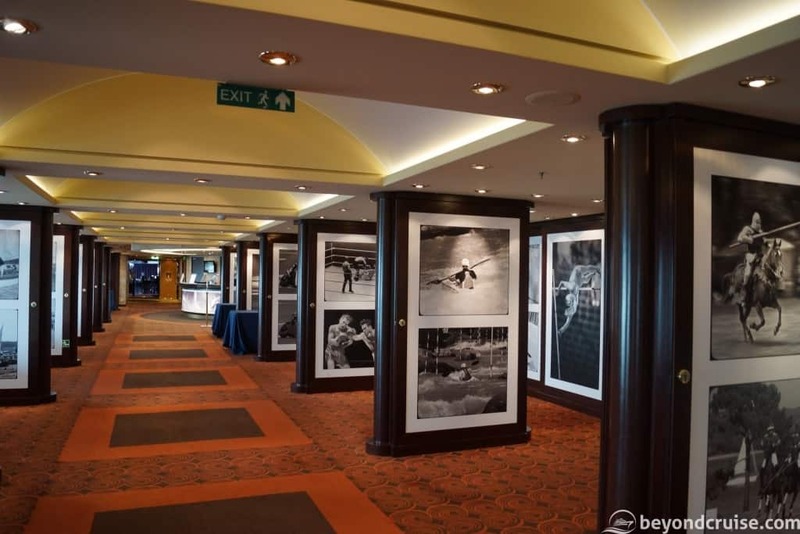 Next up is the MSC Photo Gallery where you can see all the photos that the ship’s photographers have taken of you (embarkation, elegant evenings, port calls, etc) and L’Olimpiade Sports Bar which continues down the right hand side of the ship until you end up in the MSC Photoshop (this sells actual cameras, accessories and such – ideal if you forget a memory card or something!). 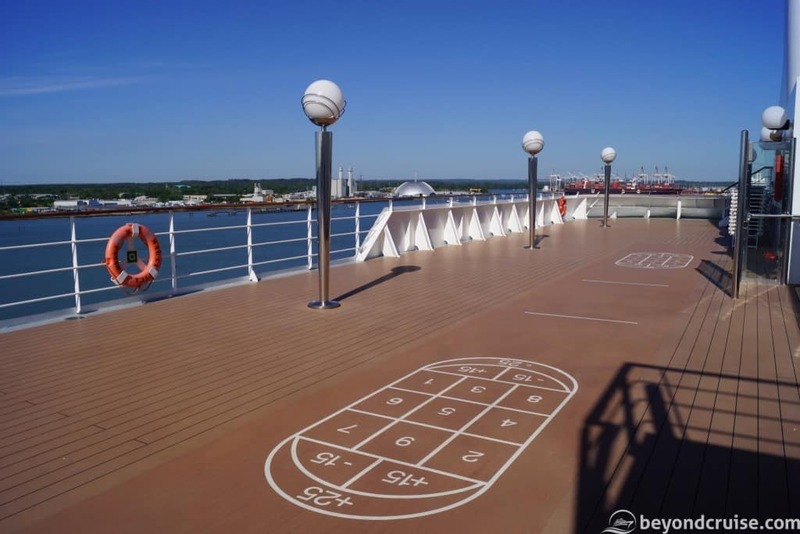 Also to note on this deck you can actually walk around the outside of the ship. 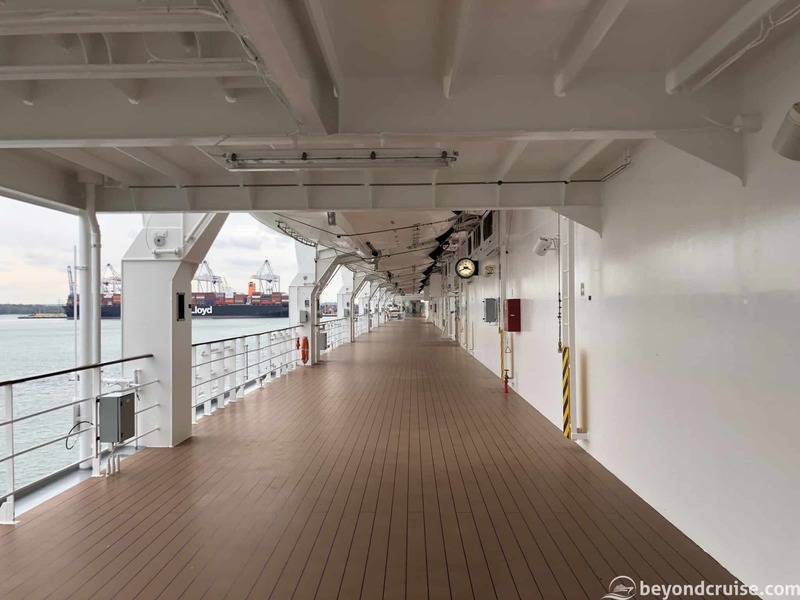 There is a full horseshoe-shape outdoor deck that wraps around the front of the ship (that part is covered) and allows you to walk nearly entirely around the ship. 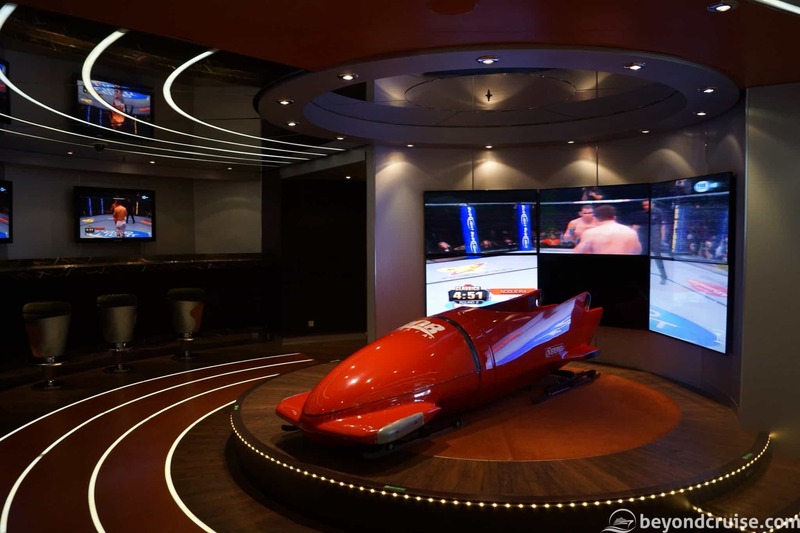 We have a YouTube video of us walking around it, but there is also a photo. 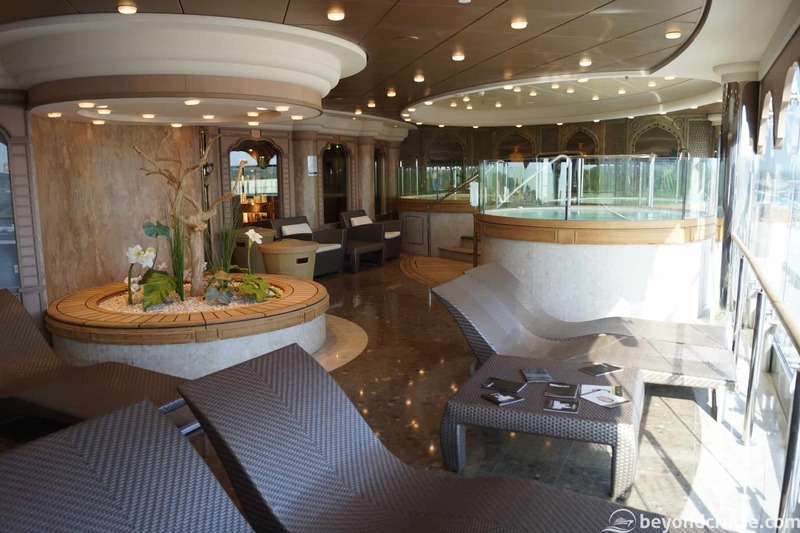 This is an accommodation deck and full of cabins. There is nothing to visit here sorry! 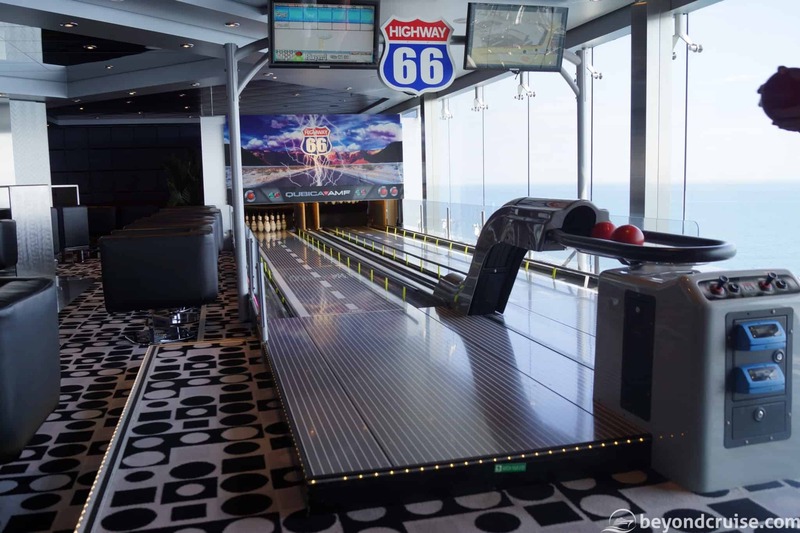 This is like Deck 8, also an accommodation deck. 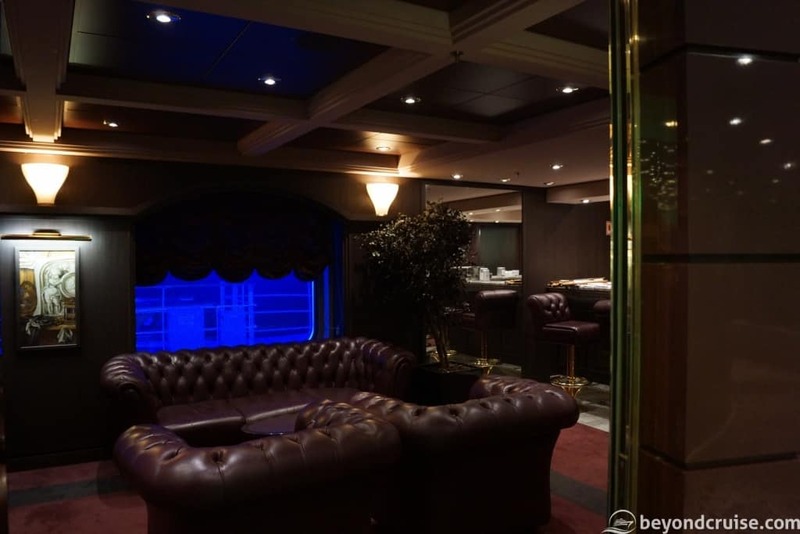 However, if you head to the very front of the ship (on the port (left) or starboard (right) hand side, you’ll find a large door. 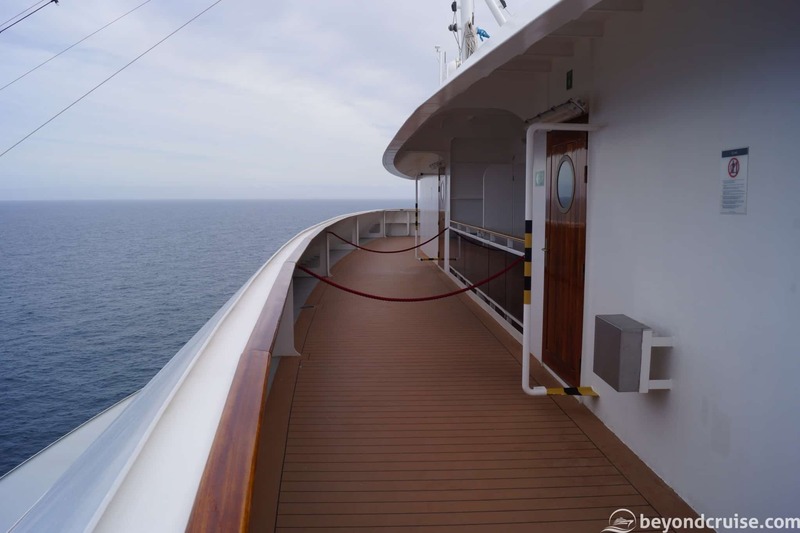 Open that, go through it and open the large brown door – you are now on the Deck 9 Forward viewing balcony which runs the entire width of the ship! 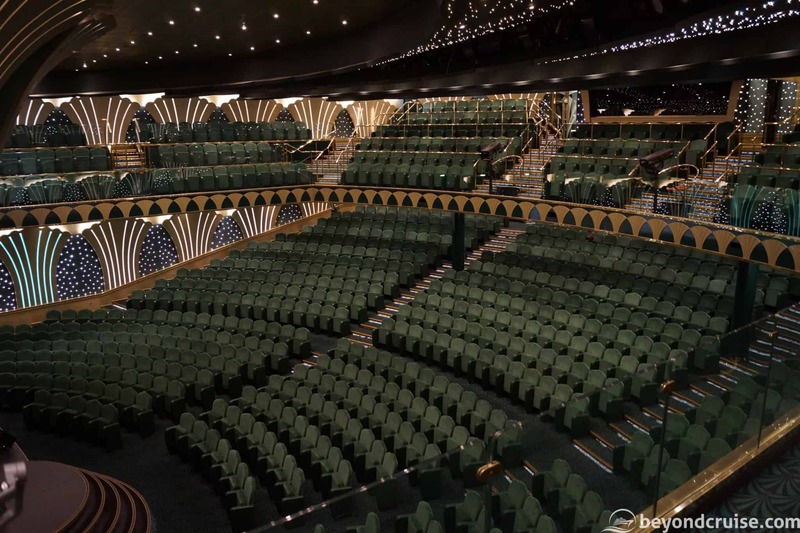 This deck is the same as Deck 9, again, head to the front for the viewing balcony! 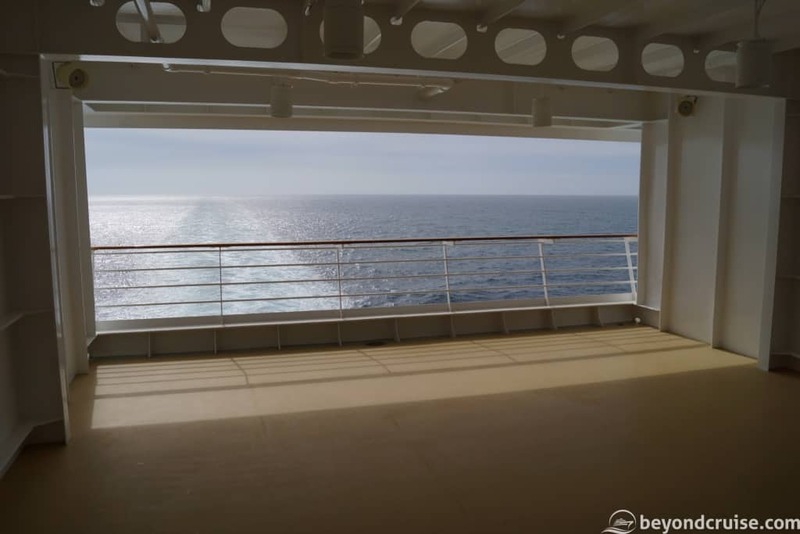 Exactly the same as Deck 10 – head to the front for more viewing opportunities across the bow! 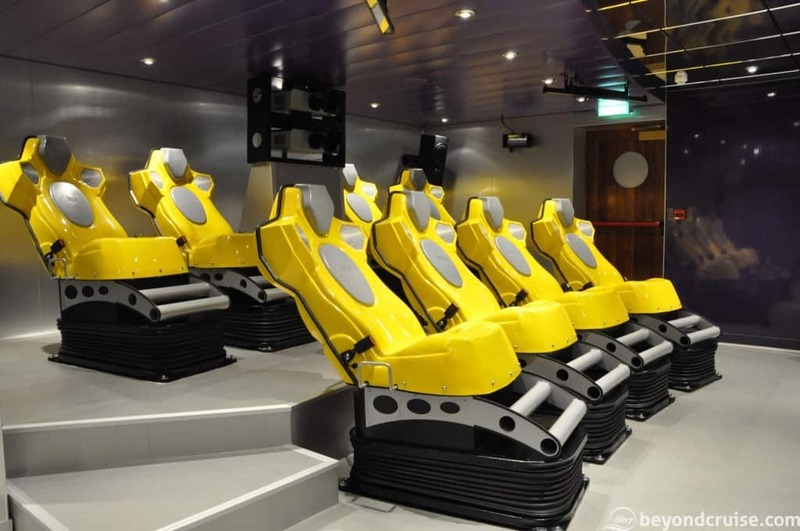 There is also an outside area at the rear of Deck 11, but read Deck 12 to find out how to access it! 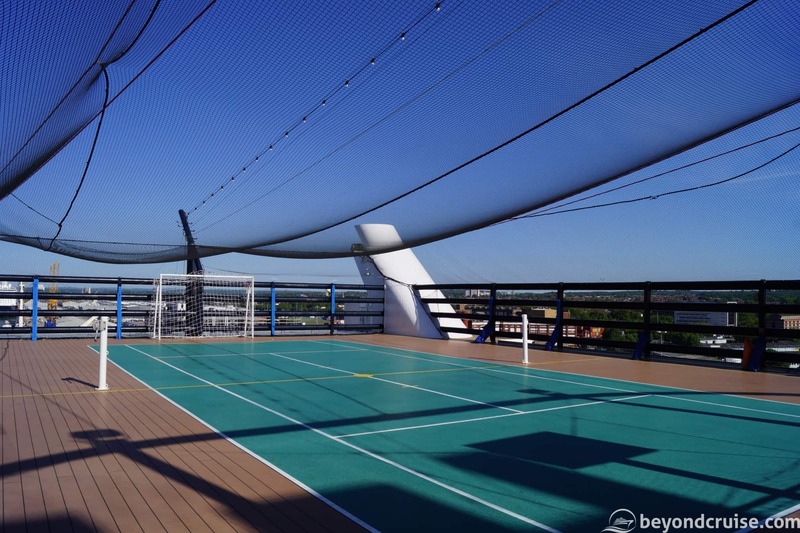 This is another accommodation-only deck. However, don’t be caught out – Deck 12 does not have access to the viewing balcony, because The Bridge is actually on this deck! However, there is a secret (?!) public area available at the very rear of the ship. 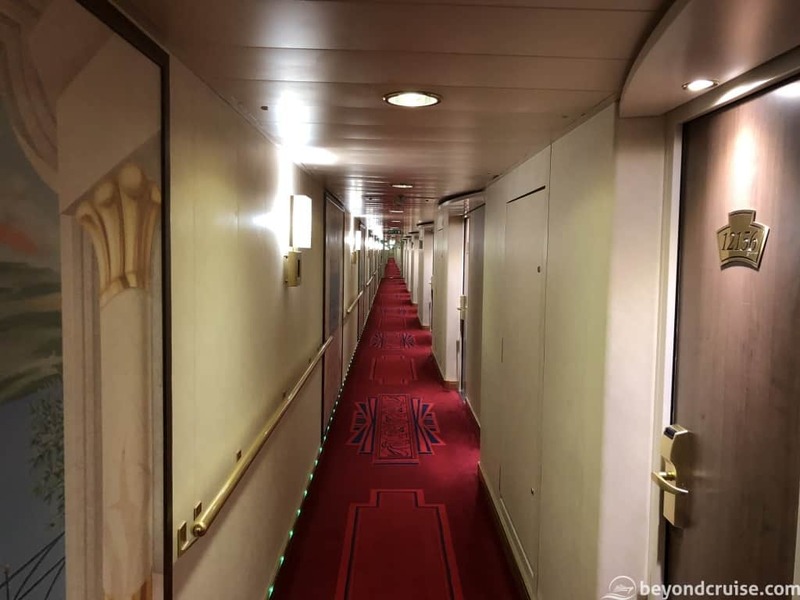 To access this area, you need to walk along the accommodation corridors on either side of the ship (but for this example we’ll use left) and keep heading back as far as you can get. You will eventually get to a corridor that offers a left or right. If you go left you’ll reach an outer door and a tiny outdoor deck (no chairs, sun-loungers or anything here!) with a staircase allowing you to reach an identical small deck below it. If you go right, you’ll reach a central outside door and there is a large outside (covered) deck area, no chairs or anything here either. You can take in great views from the back of the ship here. 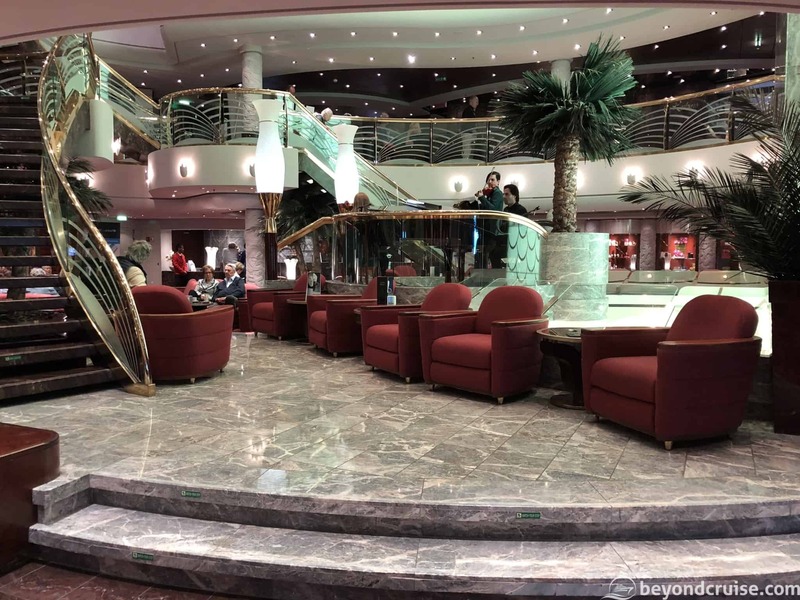 If you continue the same way out of the central area you’ll find another balcony on the right-hand-side of the ship and staircase to a lower version of it too! 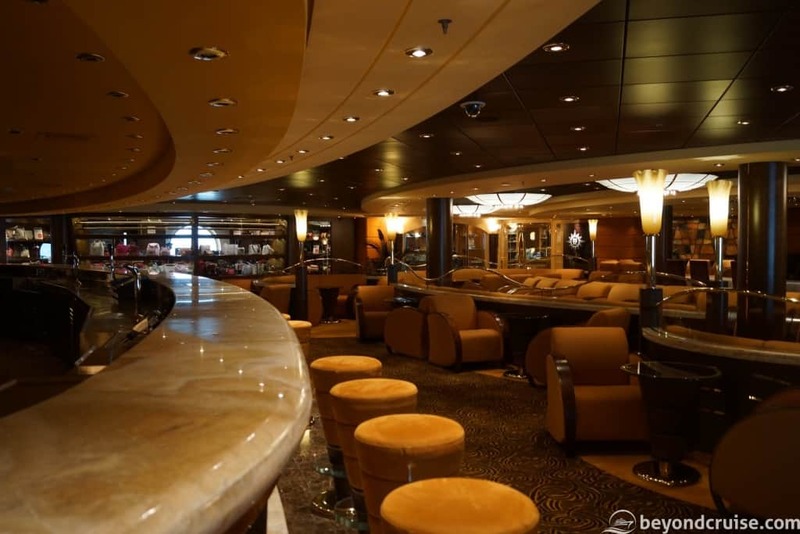 These hidden areas are great for private sail aways. 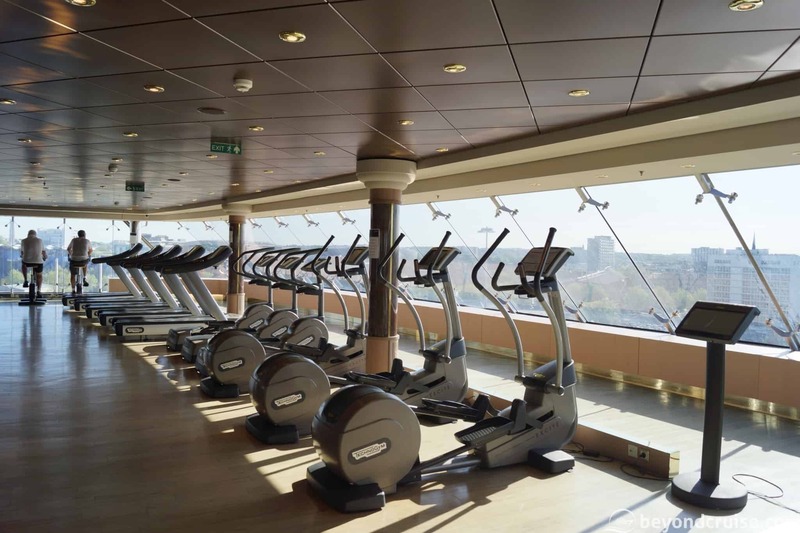 At the very front of the ship we have the gym, this accessed via the MSC Aurea Spa. 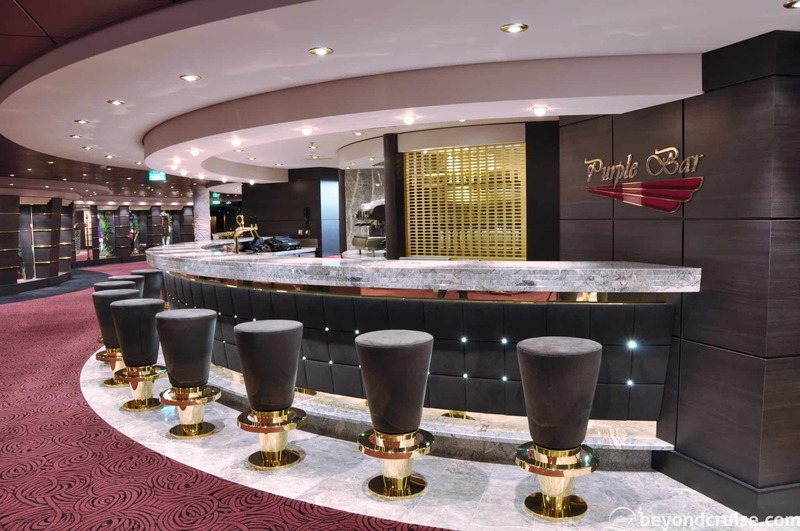 The MSC Aurea Spa is located just behind the gym and offers an extensive amount of treatments, a healthy juice/herbal tea bar, a full thermal suite (inclusive for MSC Aurea experience passengers) and also the Jean Louis David hairdressers/salon. Additionally, there are massage rooms and tanning lamps located here. 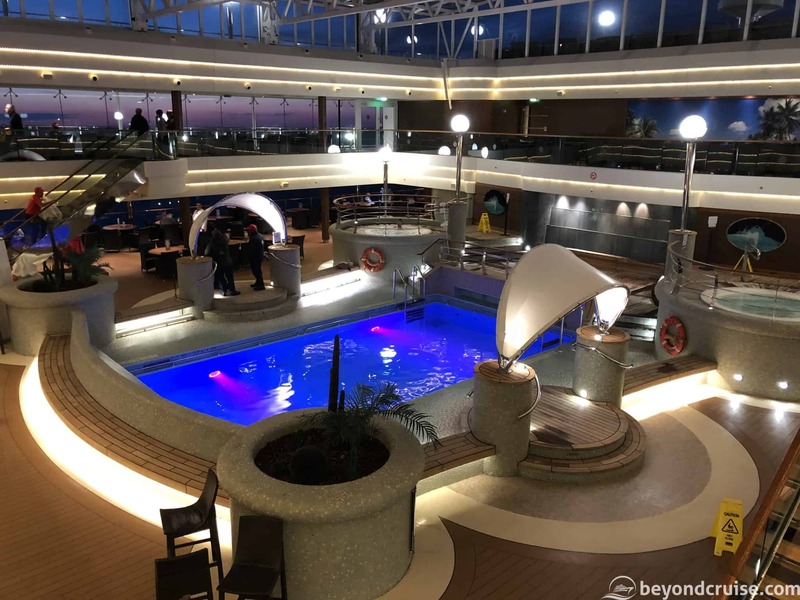 As we head out of the MSC Aurea Spa and towards the rear of the ship we enter the first outdoor space on the ship, Le Gran Bleu (outside pool), this has a rear-facing bar called Le Conchiglia Bar attached to it and is open port and sea days (weather dependent). 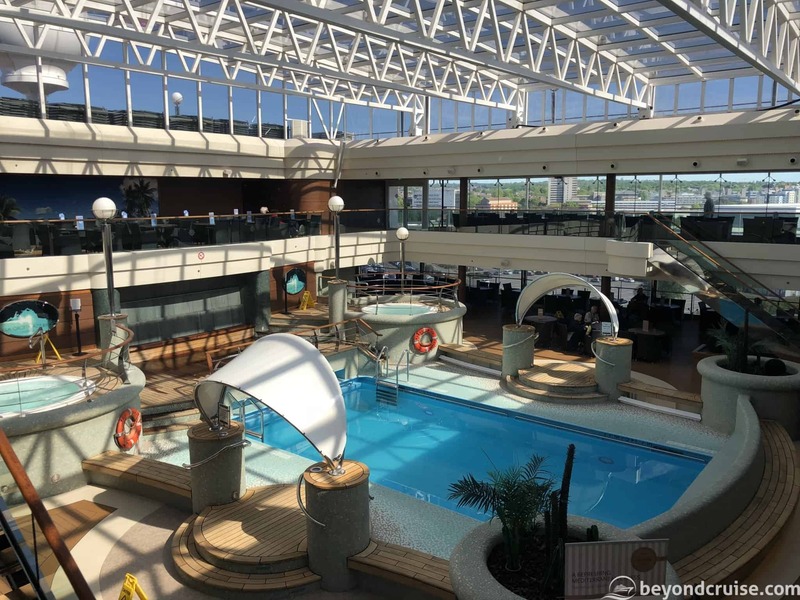 The pool area has multiple showers on the outside of it and two whirlpools either side, all are free of charge for any passengers and are open (depending on weather) on port and sea days. There are sun-loungers dotted across the entire deck and under the above walkway are tables and chairs which are ideal if you want some shade. Towels for the loungers/pool are found in your cabin and you can request a blanket from one of the staff on duty if it is a bit cold! 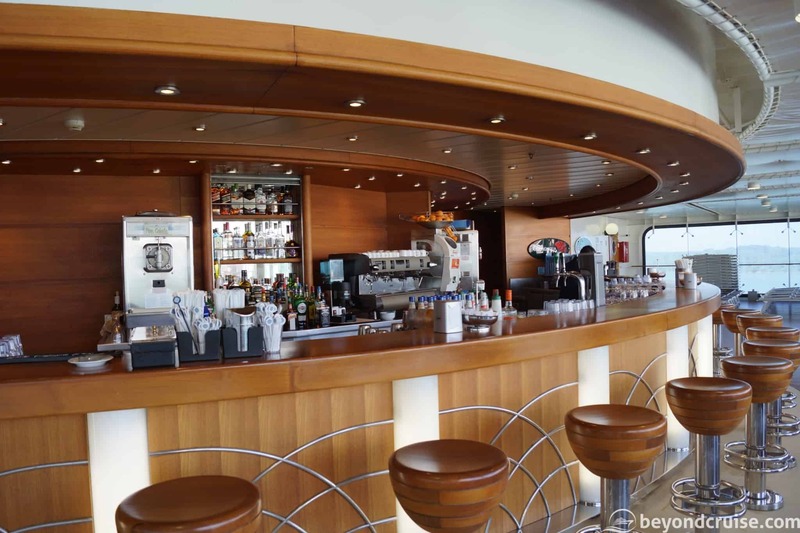 As we head further back, you enter a small covered area (on either side of the ship) and enter La Grotta Azzurra Pool Area (the inside pool), again there is another large bar in here – La Barchetta Bar and this bar offers a wide range of drinks. There are multiple seating options in here, including benches by the pool and tables along the sides. The pool is open port and sea days and also includes two whirlpools either side, again these are free of charge for any passengers. Unfortunately, there are no changing rooms here, but there are two toilets either side of the bar and the nearest lift lobby isn’t too far away. As we head back further you enter the Sahara buffet, the buffet is accessible from both sides during breakfast, lunch and in the evening. There is plenty of seating in here and drinks are available at all times. 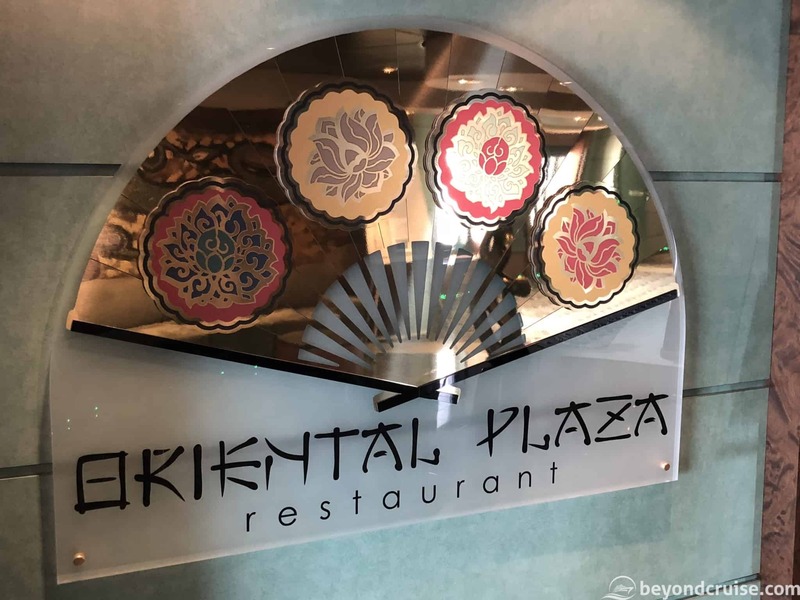 At the back of the Sahara buffet is the furthest staircase and lifts and if you pass this area you enter L’Oasi Restaurant. This has a dual purpose – during the busier times (sea days) it is an extension of the buffet, at other times it is used for family or large group seating. This restaurant also has a rear-facing bar. At the back of L’Oasi restaurant are two doors located on either side. These offer access outside to the covered terrace area. There are around sixteen tables here and they are available at all times. This is an ideal place to sit and have a drink or bring your breakfast/lunch/afternoon snack/evening meal out to eat during nice weather. 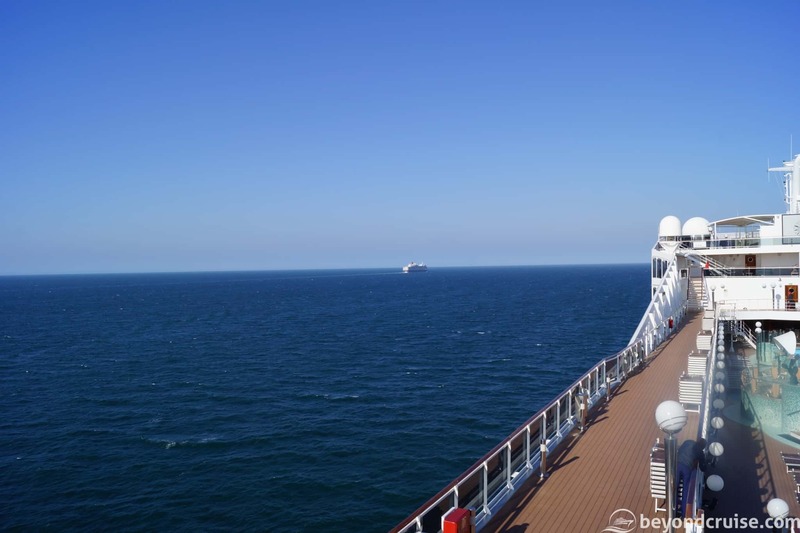 You can also enjoy some spectacular sail away views from here. 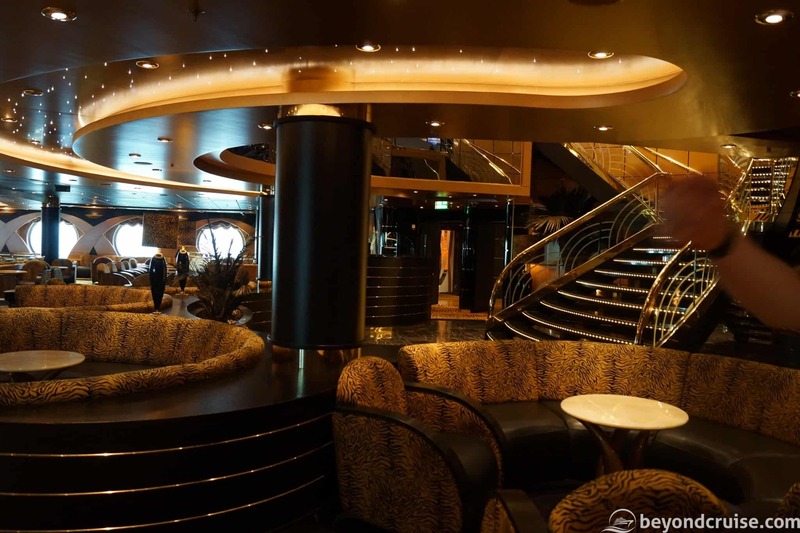 Finally, there is a staircase either side of the terrace that allows you access up to Deck 14. Starting at the front of this Deck (on either side) are doors allowing access to the forward balcony viewing area. This offers great views when sailing in/out of a port or at sea, but can be sometimes closed if it is too windy. As you head back you immediately enter the upper tier of the La Gran Bleu, this has sun-loungers on all four sides around the pool area. The power-walking track is also located in this area. 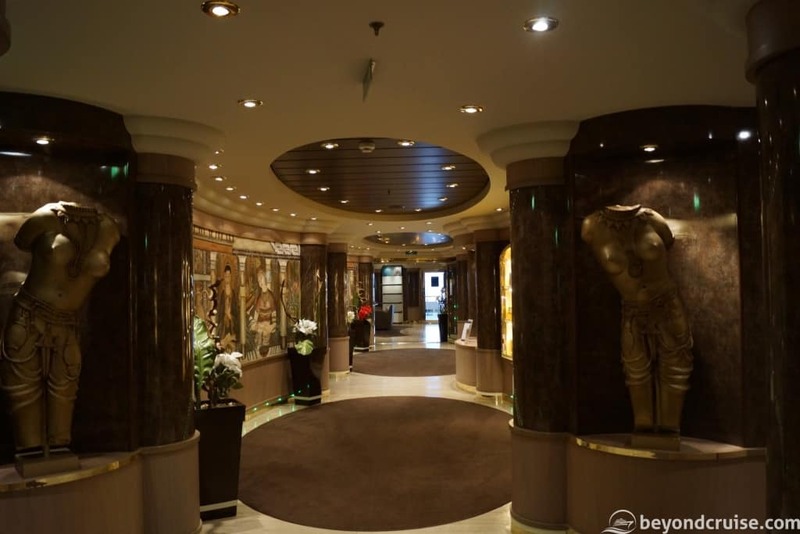 As you head to the rear of La Gran Bleu you will find door access to the upper tier of La Grotta Azzurra. On this (inside) upper tier there are many tables and chairs and there is waiter service for drinks. Continuing further along (outside) you’ll find a vast area of open deck space to enjoy walks along whilst looking out at the port or to sea, several areas include sun-loungers. On either side, you’ll now reach the outdoor kids club area. Which is a gated area for children to play on slides and outdoor toys and a small splash pool. Next to this is Underwater World, a small soft play area which is ocean-themed and features colourful fish, submarines and a giant octopus, this is for children only. 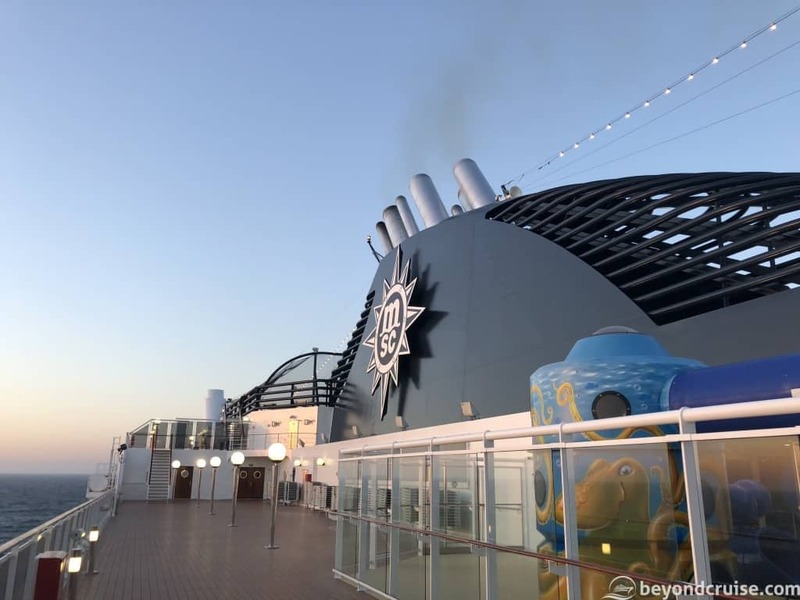 As we continue back you have an option of either entering the ship again through a large brown door (on either side) or climbing up a small set of steps to the next deck. For now, we’ll enter the ship to continue Deck 14. Once inside you are immediately at the rear stairwell and lifts. There are two toilets located on either side. 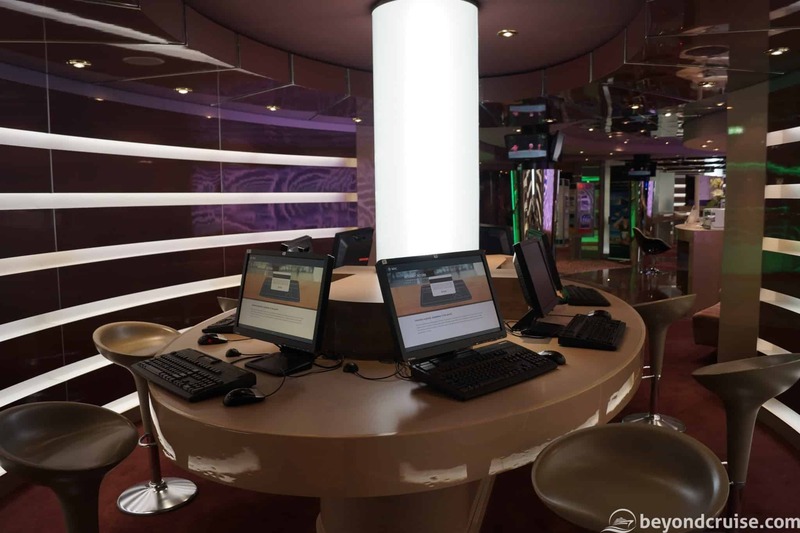 If you head to the rear on the left you’ll find access to the 4D Cinema and the Games Arcade. There are several games in here and the opening hours are published in the daily program. 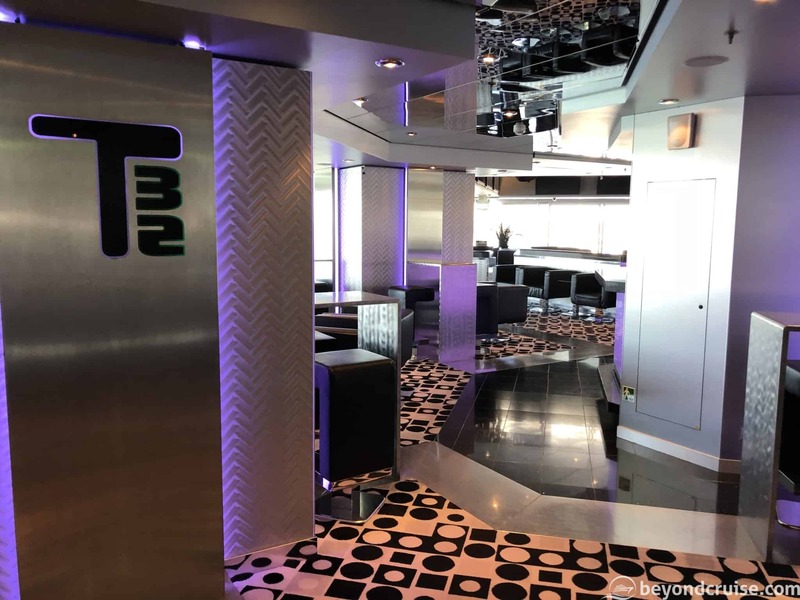 Continuing further, you’ll enter the T32 Nightclub. 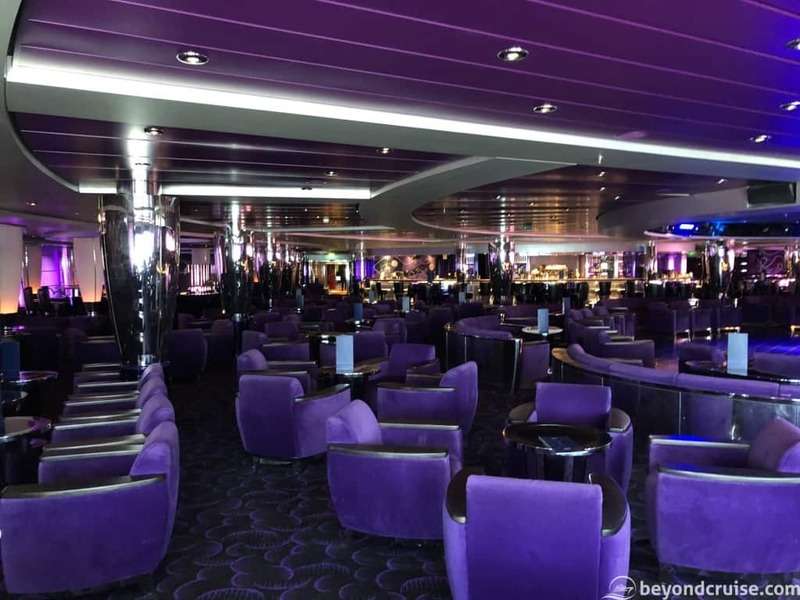 This club is only used in late evenings and is very glitzy in an Italian way. It has a large bar and several different seating configurations available (tables of two, large tables, barstools). On the left-hand side, the Ten Pin Bowling (two lanes) is situated. The bowling is open at all times even when the nightclub is closed. 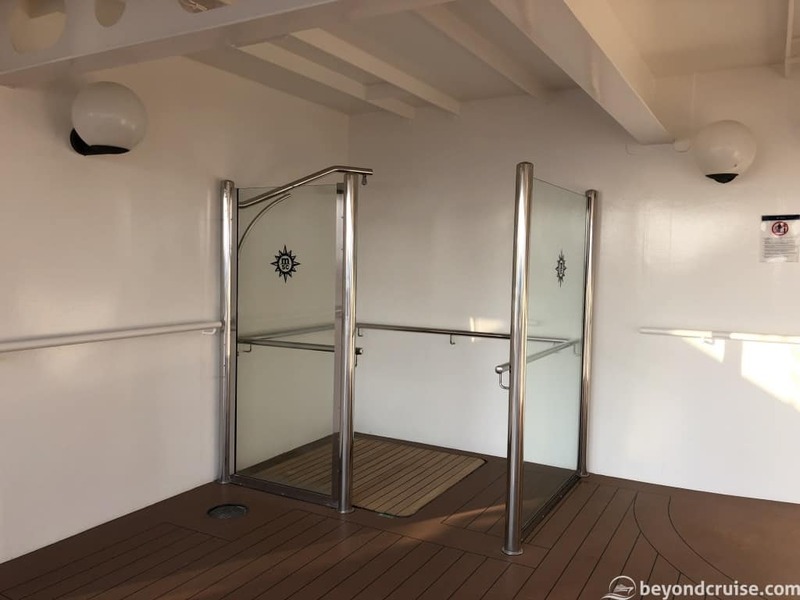 From here there is door access to the outer deck and you can take in the views from the back of the ship or use a staircase to go down to the covered terrace on Deck 13. If you had entered the T32 nightclub on the right-hand side of the ship, you would encounter the Mini Club (children 3-6 years old), the Juniors Club (children 7-12 years old) and the Teens Club (children 13-17 years old) – all have different opening times and are documented in the daily program. The first two clubs offer arts and crafts, group games and the other activities and the latter club offers music, video games and other activities. 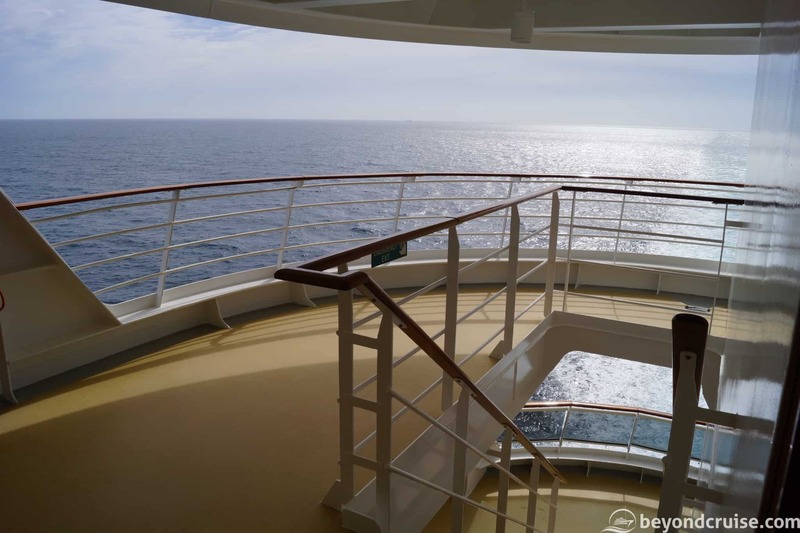 At the very front of Deck 15 is the highest forward-viewing outdoor balcony. This is not the entire width of the ship as two cabins on this deck have forward-facing patio doors this way too. Therefore you only have a small amount of access to this balcony. 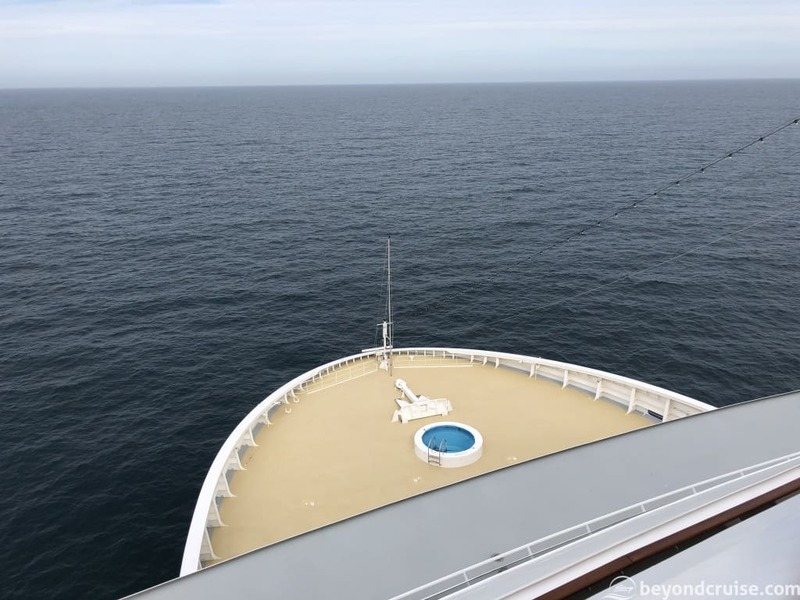 For the sake of the privacy of the cabins on this deck, it would probably be preferred if you went to one of the other four forward balconies lower down instead. This rest of this deck is split into two parts. At the front of the ship (accessible via lift, stairwell or outside stairs from Deck 14) is a small area with two outdoor showers and sun-loungers. There are also two toilets located either side here with panoramic windows out to sea (not the toilets, but where you wash your hands!). 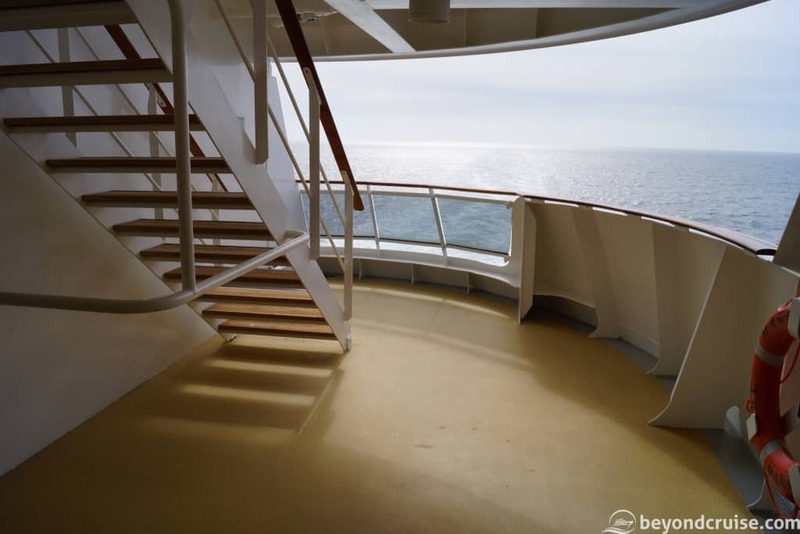 To access the rest of Deck 15 you need to walk all the way along Deck 14 until you reach a rear staircase which takes you up to Deck 15. 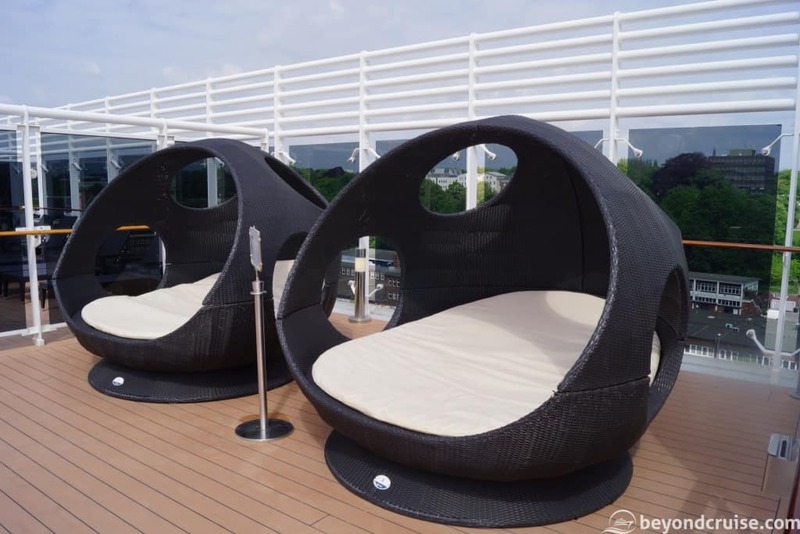 This area offers some sun-loungers and deck space for you enjoy views from the ship. There are also some outside games here, such as shuffleboard. This deck is split into two parts too. The first part is at the front of the ship. 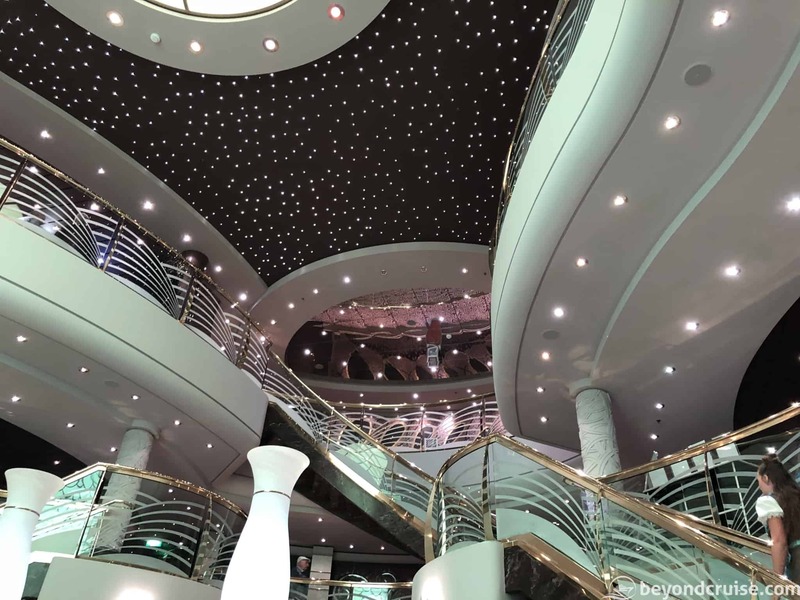 It is accessible via a staircase inside or outdoor stairs from Deck 15. 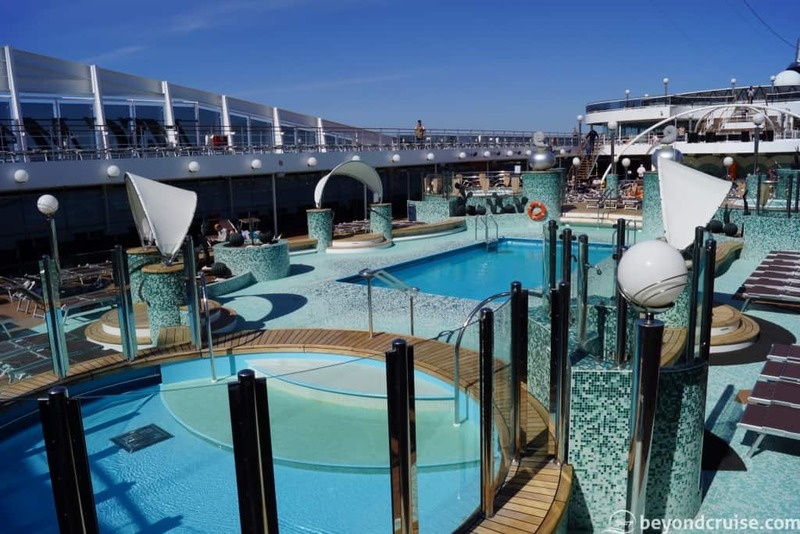 This deck contains Top 16 – The Exclusive Solarium. 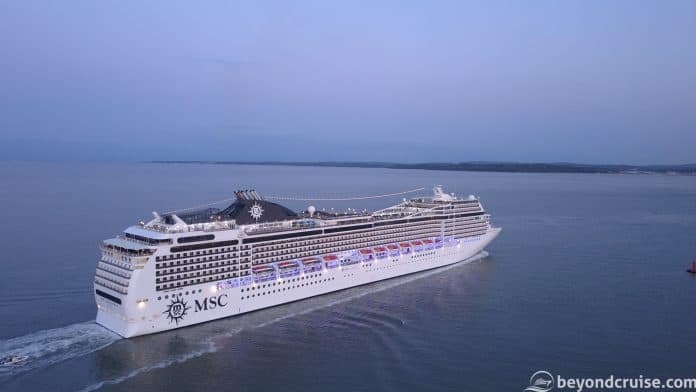 It is open every day (weather dependent) and is free for MSC Aurea Experience passengers or available in a half or full day rate for other passengers. 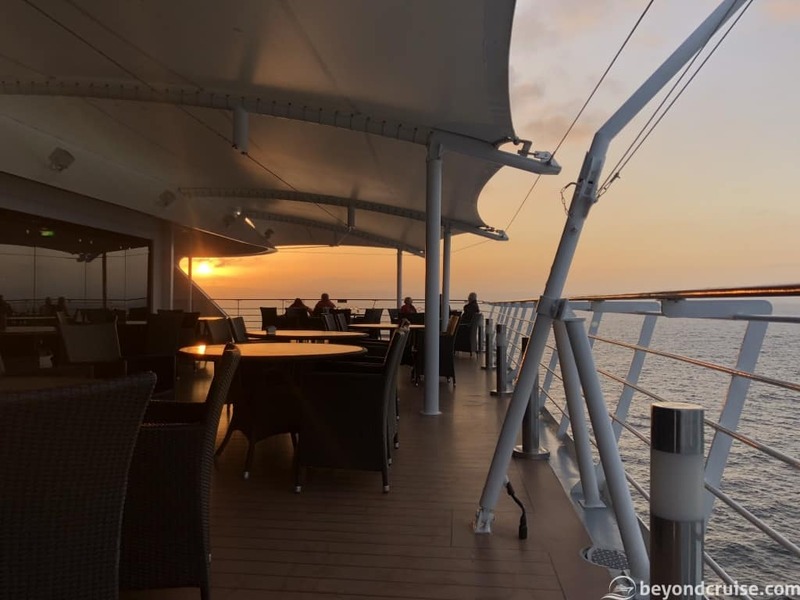 There is a private bar on this deck and the deck is split into multiple sections with premium sun-loungers, two-person cabana-style beds and two extra-large hydromassage pools (one located either side of the deck). 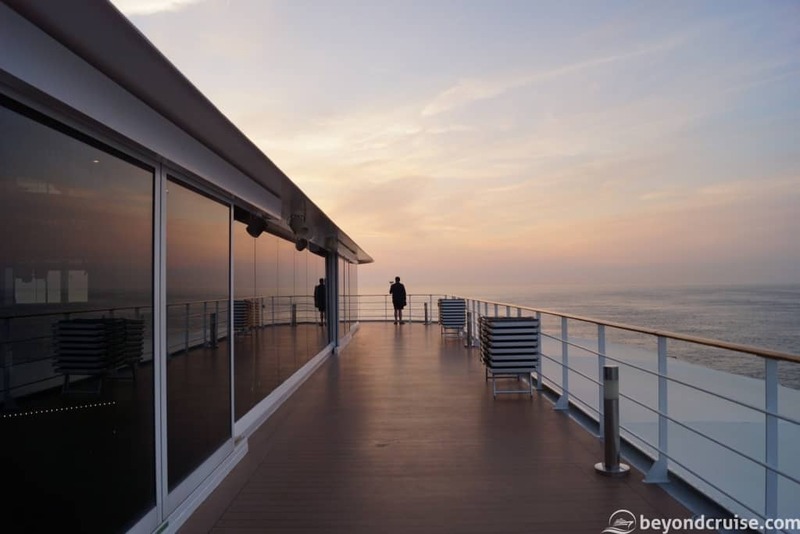 At the front of the deck is glass and it shields the wind from the front of the ship whilst offering views forward. The second part of Deck 16 is accessed via the rear-part of Deck 15. Just past the huge MSC logo sign near the funnels is a staircase up to the netted Sports Center. In here you can play football, tennis, basketball or any other ball game and because it is totally netted – no worry that your ball will fly off the ship!